I figured out how to add plug modules both new and FROM IRIS. How do I schedule them by simple time, sunrise/sunset? I have couple to go on at sunset and off at say 2200 hours. I also have a couple to ON upon disarm, once I get there with the HSM, as I did get the IRIS keypad online. It's a simple Rule Machine rule. If you have not installed Rule Machine, you need to do that. The easiest way to get familiar with HE and your system running like you had is to install the Simple Lighting app, it will walk you through this logically; however, you will have to create one function to turn the lights on at sunset and a second function to turn them off at a desired time. 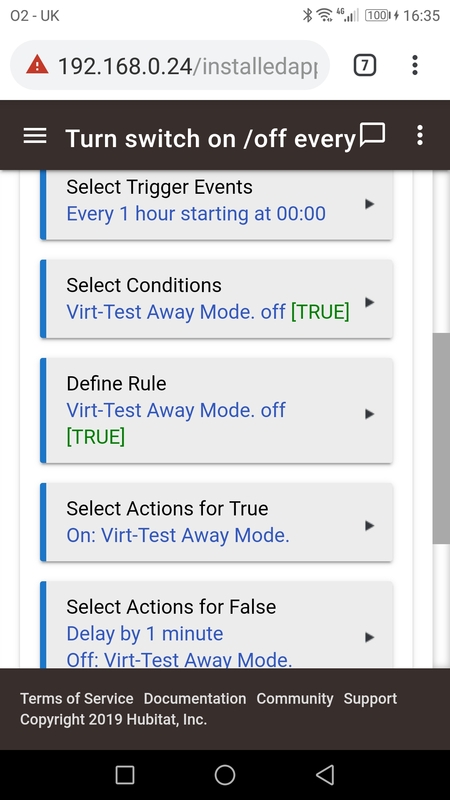 The app is a little too simple, but it may help you until or if you decide to start writing rules. Motion lighting is another necessary app for a newbie. While I cannot disagree with the above post, personally I would recommend using Rule Machine just so that you get used to using it so that when you progress into more complex rules, and trust me you will, you will have some basic knowledge of it. Just my opinion and whatever you choose as long as it works for you, all is good. so that you get used to using it so that when you progress into more complex rules, and trust me you will, you will have some basic knowledge of it. Good advice, as I'm less than a month into HE, and I'm seeing now there are many rules that I could have just as easily accomplished with just using a trigger rather than a rule. And will be changing these shortly. I may be wrong. But looks to me like this rule would work backwards to what you want. 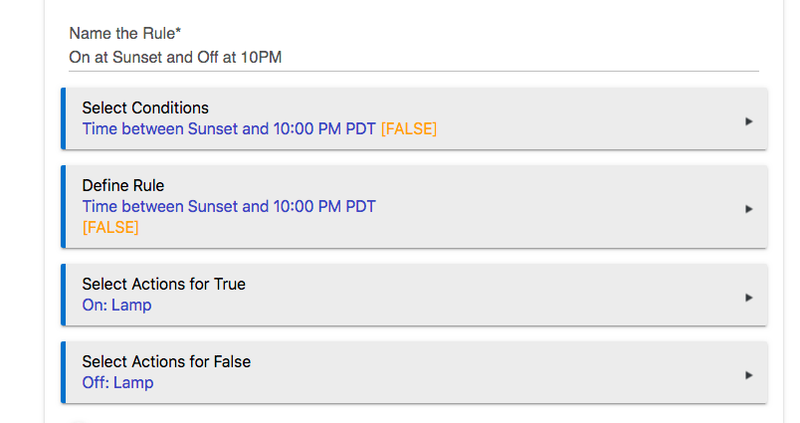 I would have thought False would make them on for the time you want and True would turn them off in this Rule. Correct me if I'm wrong. I'm new but have several Rules set up. 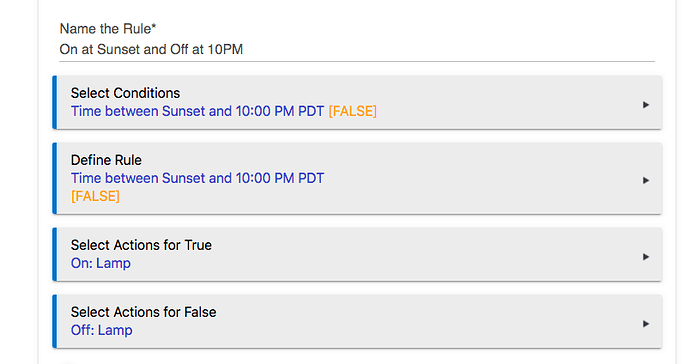 If the time is Between Sunset and 10pm (assuming sunset is before 10pm) then the rule is True. Got this in and moving forward, stalled again. Trying to get the chime set up on the door. I have set a trigger using the door contact, but the keypad doesn't respond... so far. I think I know where I goofed. I need to turn on a switch about once every hour for one minute or less. It's to supply water to an animal pen. The switch will energize a NC valve solenoid. 24/7. eventually will add an additional condition of OAT <= 35°F to stop and OAT > 37°F to start again... at least before next Fall's freeze. Ultimately this will lead to being able to control a different valve[s] to shut water off when ARMED AWAY. I need to turn on a switch about once every hour for one minute or less. Use a triggered rule for 'Every Hour'. For temperature element just put another condition in 'temp => 37. Both switch off and temp above/equal to 37 need to be true for the switch to turn on.